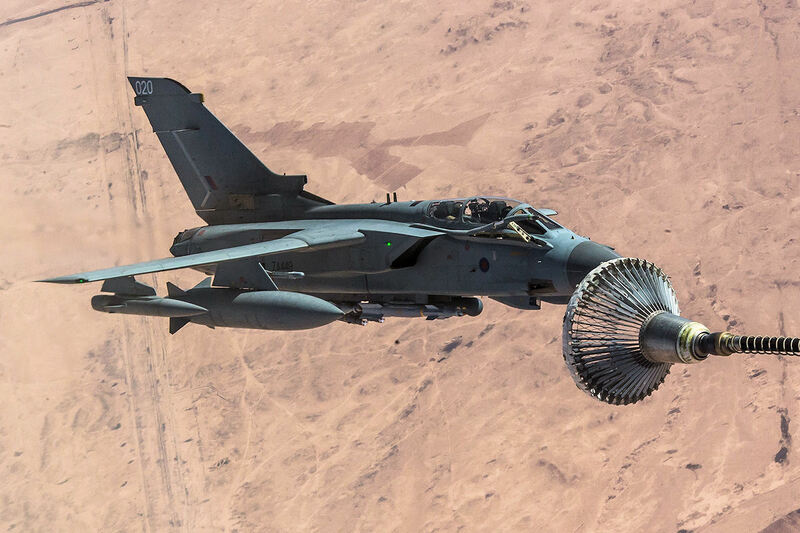 The Coalition refers to a broad collection of nations providing different levels of support to the various factions in the wars in Syria and Iraq. In Syria, military support for Rojava comes from the United States, Australia, France, the Netherlands, Jordan, Morocco, the United Kingdom, Belgium, Denmark, Bahrain, Qatar, Saudi Arabia, Turkey, and the United Arab Emirates (and formerly Canada). 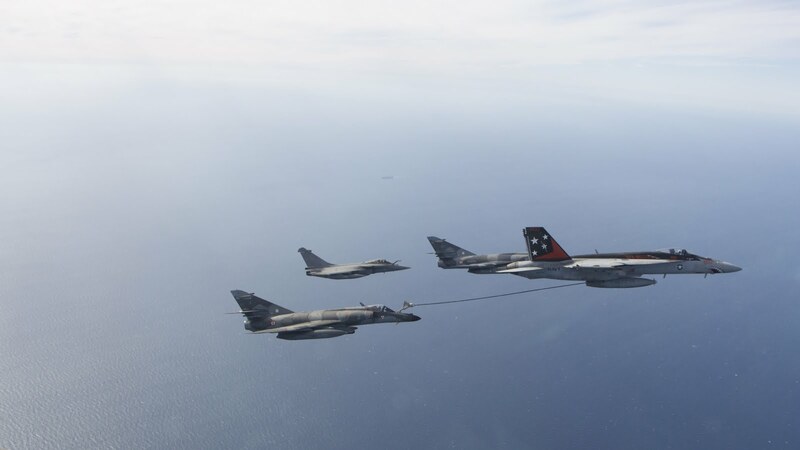 These nations make up Combined Joint Task Force – Operation Inherent Resolve, otherwise known as CJTF-OIR. Additional military aid is provided by Albania, Bosnia and Herzegovina, Bulgaria, Croatia, Cyprus, Czechia, Estonia, Canada, Germany, Greece, Hungary, Italy, Kuwait ,Lebanon, Spain and Singapore, along with other unnamed Eastern European and Middle Eastern nations. Unfortunately for Rojava, these airstrikes would largely only begin after the city of Kobanê was nearly overrun by Daesh. Prior to this, the Rojava conflict was largely unknown to Westerners, but the actual clashing with outside forces began for Rojava all the way back in 2011, shortly after the aforementioned protests took place. There were reports on 16 March 2011 of clashes in Al-Hasakah between government forces and local protesters. The early morning of 23 March 2011 saw bloodshed in the southern city of Dara’a, with 15 or 16 protesters being killed by police and military officials. The 31st saw great promise for the Kurds; initially, President Assad offered to investigate the loss of Syrian citizenship by 150,000 Kurds in Al-Hasakah under his father Hafez al-Assad, an attempt to placate the Kurds and keep them from joining the rebellion. As April began, chaos began to spread to certain parts of Syria. Unknown gunmen began firing on protesters. 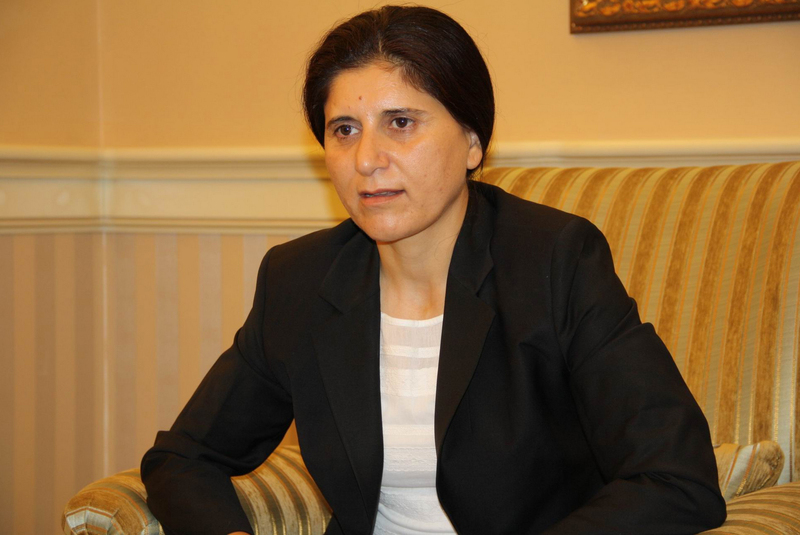 On 7 April President Assad granted citizenship to 220,000 Kurds who had been stripped of their nationality in the 1960s (along with their children) in a further attempt to calm the Kurdish people and prevent them from joining the revolution. April 22nd became a rallying call for many around the nation, with mass protests resulting in at least 100 deaths. April 25 saw the beginning of the siege of Dara’a, which ended with several hundred civilians killed. The siege saw some of the first widespread use of military against civilians, including at least 20 tanks. This resulted in solidarity protests in many Syrian cities on the following friday, April 29th, as students and workers got out of their jobs and classes for the weekend. In Al-Qamishli, at least 15,000 people stood together and chanted “With our soul and with our blood we will sacrifice ourselves for Dara’a”. May saw a dramatic uptick in violence, with several other cities coming under siege. However, protesters were not dissuaded, and many thousands kept taking to the streets in cities like Homs, Hama, Dara’a, Latakia, and many more. 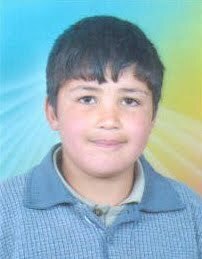 In Dara’a, the body of a 13-year-old boy named Hamza Ali Al-Khateeb was returned to his family after a month in police captivity. The body showed signs of mutilation and torture, and his death reinvigorated protests around the country. By now at least 1,000 people had been killed around Syria, with at least a dozen cities and towns under military siege. Jisr ash-Shugur was attacked with gunships and tanks and was finally stormed on the 13th of June. Seven days later, President Assad gave a long, rambling speech, in which he blamed foreigners and outside intervention for the protests and the violence. This served to further aggravate the Syrian people, who took to the streets in greater numbers than ever before. Protests began in Damascus for the first time, and the international community began placing sanctions on Syria. In Deir ez-Zor, mass protests of over 450,000 people began taking place in late June and early July, finally culminating in a mass defection of Syrian army personnel on the 29th and the creation of the Free Syrian Army, or FSA. The next major date for Syrian Kurds was 7 October 2011, when activist Mashaal al-Tammo was murdered by unknown gunmen in his home. The attack was later blamed on the government. In Al-Qamishli, tens of thousands took to the streets outside the hospital al-Tammo’s body was taken to in protest. The following day at least 14 mourners were killed in a government crackdown after around 50,000 people took to the streets of Al-Qamishli to remember al-Tammo. 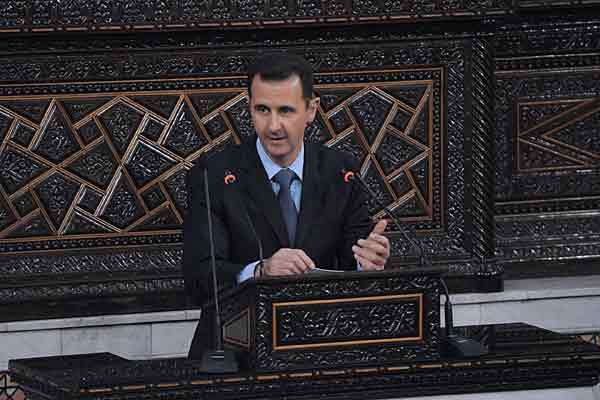 On January 10, 2012, president Assad gave a rambling speech in which he blamed the ongoing unrest on foreign dissidents, provocateurs, and terrorists, a line he would continue to echo for years to come. In February the war began to take on a darker turn, with hundreds being killed by the Regime on a daily basis. In the international realm, several nations, including the United States and the Gulf Cooperation Council (GCC) nations (Bahrain, Kuwait, Oman, Qatar, Saudi Arabia, and the United Arab Emirates) closed or restricted their diplomatic missions to Syria. 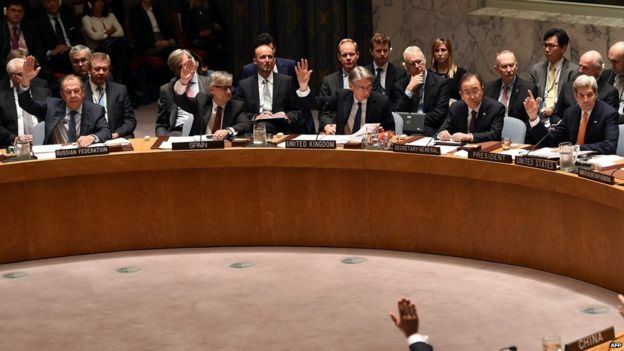 Sanctions were attempted through the United Nations Security Council (Resolutions S/2012/77 and S/2012/538), but these were vetoed by Russia and China. From February until June Kurdish front stayed largely quiet, with mass protests occasionally breaking out in Al-Qamishli. 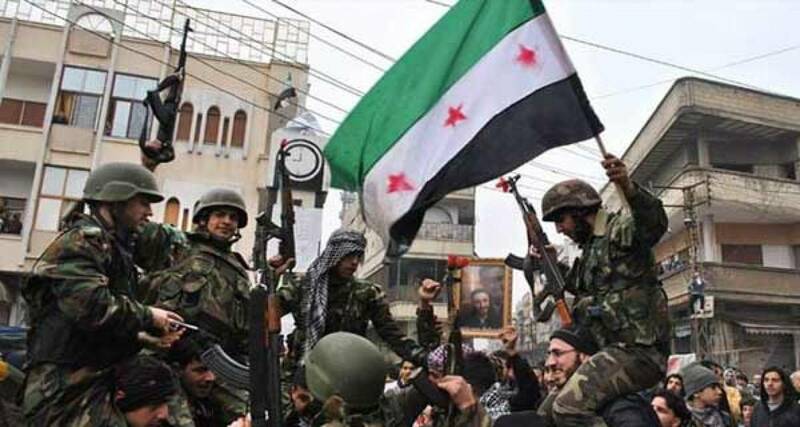 On 19 June the FSA called upon the Kurds to join in the fight against the Syrian government. In exchange, they promised to end “injustice” against the Kurds in a future Syria. On 19 July the border city of Kobanê was taken over without a shot fired by the Kurdish Popular Defense Committees as the SAA pulled back to cover the “heartland”. Toward the end of July, Salih Muslim, one of the co-leaders of the PYD, told the BBC that the Kurds were ready to “govern themselves”, but reiterated that he did not mean Kurdish independence; rather, he was referring to increased autonomy in a new, democratic Syria. Throughout the remainder of 2012 and into 2013 the Kurds in Rojava continued to consolidate power in their cities. 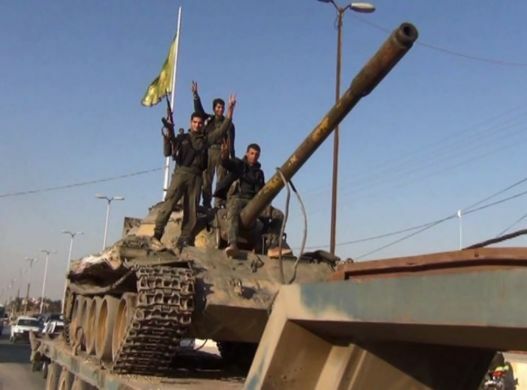 All cities were cleared of government forces save for Al-Hasakah and Al-Qamishli, wherein the garrisons remained and controlled substantial portions of the city. 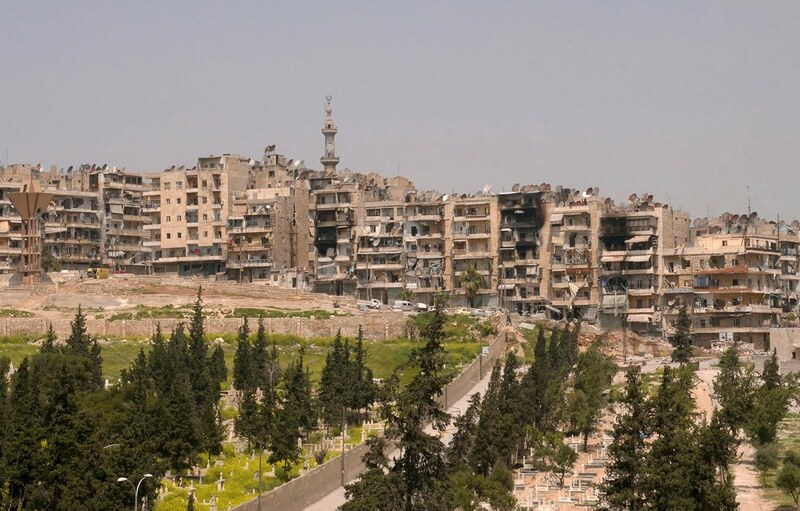 On 27 October, 2012, approximately 30 people were killed in clashes between the YPG in a Kurdish neighborhood of Aleppo and unknown Arab rebels. An additional 200 people were taken prisoner by either side (total of 200). On 18 January 2013, two radical jihadist groups, Ghuraba al-Sham and Jabhat al-Nusra (Syrian offshoot of al-Qaeda), the latter designated a terrorist group by the United States and many other nations/organizations, launched an attack on the city of Kobanê. Heavy fighting ensued, and at one point the jihadists were reinforced by three tanks that were driven in from the Turkish border. However, the YPG managed to hold the town and actually capture one of the tanks, which proved to be extremely useful in later operations. The first major clash between YPG and Islamist forces came on 16 July, 2013, in the town of Ras al-Ayn. Since the conclusion of the Battle of Ras al-Ayn on 19 February 2013, the town had been divided between Arab and Kurdish fighters. On the 16th of July, a YPJ (Women’s Protection Units) patrol was ambushed by al-Nusra (Henceforth JaN), which had recently reinforced its positions in the city with approximately 200 more fighters. The driver was captured, but two passengers in the vehicle were able to escape. Proverbial alarm bells sounded and the YPG brought in reinforcements from the nearby town of al-Derbasiya. Clashes broke out between the YPG and JaN, and within a few hours the YPG had taken control of the local JaN headquarters. By midday on the 17th the YPG had routed JaN from the city and captured the Turkish/Syrian border crossing, but not before two Kurdish and nine JaN fighters died. Fighting continued through the 19th in the towns of Tal A’lo, Karhouk and A’li Agha. 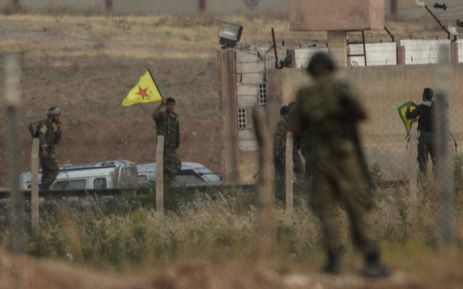 Between the 16th and the 19th at least 35 Islamist and 19 YPG fighters had been killed in the clashes. 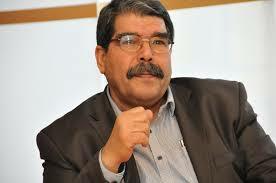 By August Daesh had announced their intention to capture the YPG headquarters city of Kobanê. 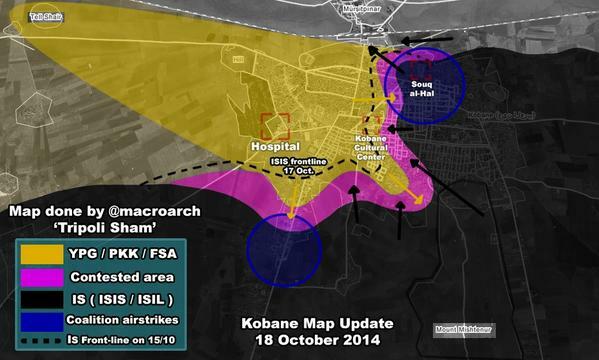 The month saw continued clashes in smaller villages around Kobanê, namely between the FSA/Islamists and the YPG. At this point, JaN and Daesh were still allies. 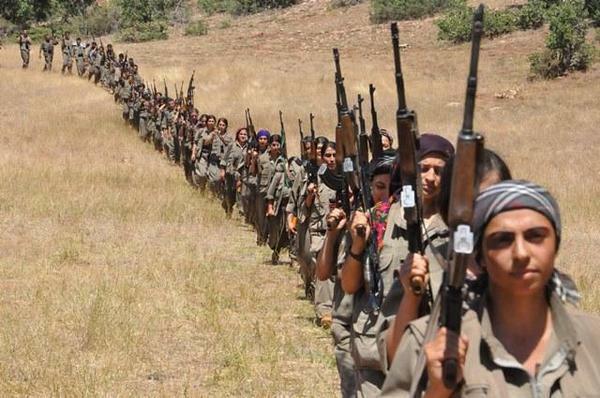 As August came to a close the YPG seemed on the retreat, with Islamist factions gaining ground in Kobanê canton. These advances, and similar advances in Aleppo, led to some Kurds fleeing toward Kobanê and Afrin. As Islamist groups, in particular Daesh, took control of these villages and towns, they began ethnically cleansing members of the Kurdish community. In the absence of heavy weapons, Daesh was able to quickly overrun YPG positions. As noted previously, Daesh has in their inventory many main battle tanks and other armored fighting vehicles, something the YPG lacked at the time (and still largely lacks). Finally on 13 September 2014, Daesh initiated a large-scale offensive to capture the Kobanê canton and the city of Kobanê itself. Since February Daesh had been separate from JaN, so as Daesh forces encircled Kobanê elements of the FSA joined Kurds fleeing Daesh and seeking refuge in Kobanê or Turkey itself. Heavy combat ensued, with the YPG pledging not to give up Kobanê and Daesh pledging not to halt until the town was taken. By 19 September Daesh had captured approximately 40 Kurdish villages near Kobanê and was advancing rapidly on the city itself. As Daesh closed in on at least 100 more smaller villages, the YPG began evacuating civilians to safety in Turkey despite sustained enemy artillery fire. All-told, approximately 300,000 civilians were evacuated through Kobanê in September/November 2014. Still others were left stranded at the border, unable to cross into Turkey as-per Turkish officials. Evidence of this human exodus is visible via satellite imagery, with thousands of cars seen parked in large encampments every several miles along the Turkish/Syrian border near Kobanê. The YPG swung into crisis mode, consolidating their forces in Kobanê and receiving at least 300 reinforcements via Turkey. Meanwhile Murat Karayilan, a senior PKK official in Turkey, called upon Kurdish youth in Turkey to answer the call and respond to Kobanê.